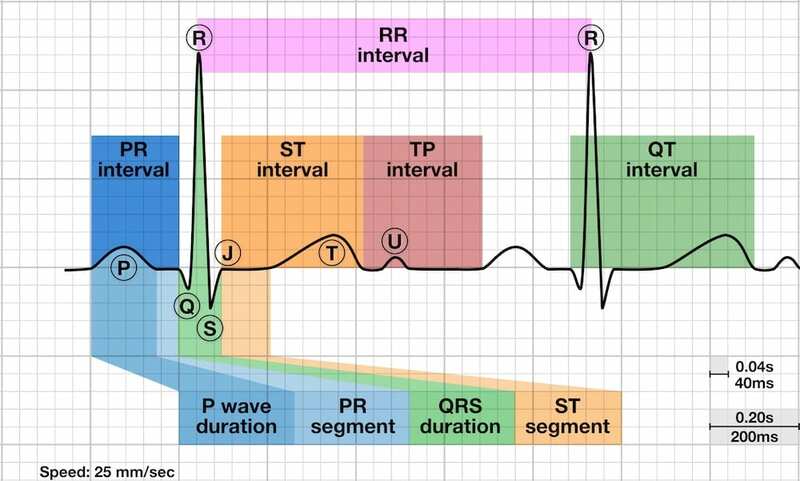 The PR interval is the time from the onset of the P wave to the start of the QRS complex. It reflects conduction through the AV node. The normal PR interval is between 120 – 200 ms (0.12-0.20s) in duration (three to five small squares). If the PR interval is > 200 ms, first degree heart block is said to be present. PR interval < 120 ms suggests pre-excitation (the presence of an accessory pathway between the atria and ventricles) or AV nodal (junctional) rhythm. Second degree heart block, Mobitz type I (Wenckebach phenomenon). Note how the baseline PR interval is prolonged, and then further prolongs with each successive beat, until a QRS complex is dropped. The PR interval before the dropped beat is the longest (340ms), while the PR interval after the dropped beat is the shortest (280ms). Wolff-Parkinson-White (WPW) and Lown-Ganong-Levine (LGL) syndromes. These involve the presence of an accessory pathway connecting the atria and ventricles. The accessory pathway conducts impulses faster than normal, producing a short PR interval. The accessory pathway also acts as an anatomical re-entry circuit, making patients susceptible to re-entry tachyarrhythmias. 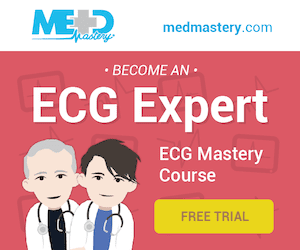 Patients present with episodes of paroxsymal supraventricular tachycardia (SVT), specifically atrioventricular re-entry tachycardia (AVRT), and characteristic features on the resting 12-lead ECG. The characteristic features of Wolff-Parkinson-White syndrome are a short PR interval (<120ms), broad QRS and a slurred upstroke to the QRS complex, the delta wave. The features of Lown-Ganong-Levine syndrome LGL syndrome are a very short PR interval with normal P waves and QRS complexes and absent delta waves. Junctional rhythms are narrow complex, regular rhythms arising from the AV node. 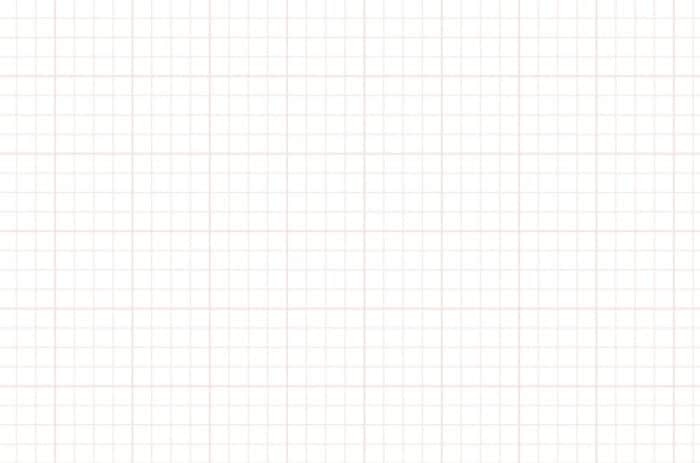 P waves are either absent or abnormal (e.g. inverted) with a short PR interval (=retrograde P waves).